Also my hair is driving me crazy. I think I want bangs again, but does anybody have any ideas for haircuts? I’ve been thinking about going kinda short, honestly, but I know Jared’s not a big fan. My reasoning is that it’ll grow out eventually if it doesn’t look good, but I’ll admit it makes me a little nervous. It’s really cold outside. 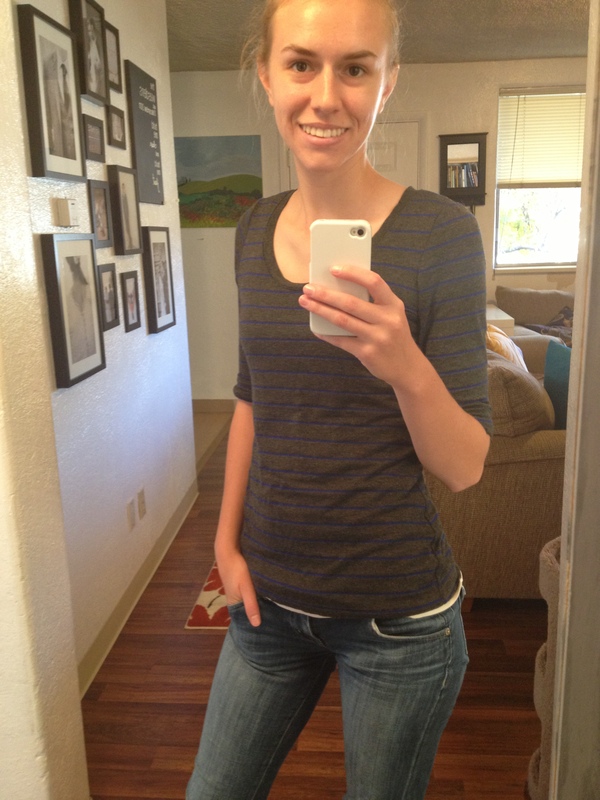 And shocker I wore makeup today (although you can’ tell), and it’s not a Sunday (I know, I must’ve been body snatched)! 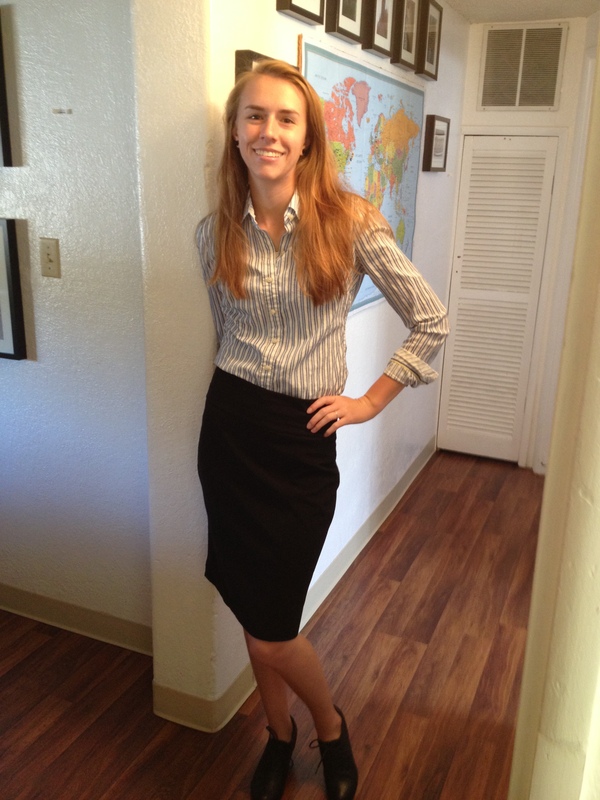 Good grief, we’re all a walking Gap-Company ad! Not only is green my favorite color, but I feel like I look pretty good in it when my hair looks redder. 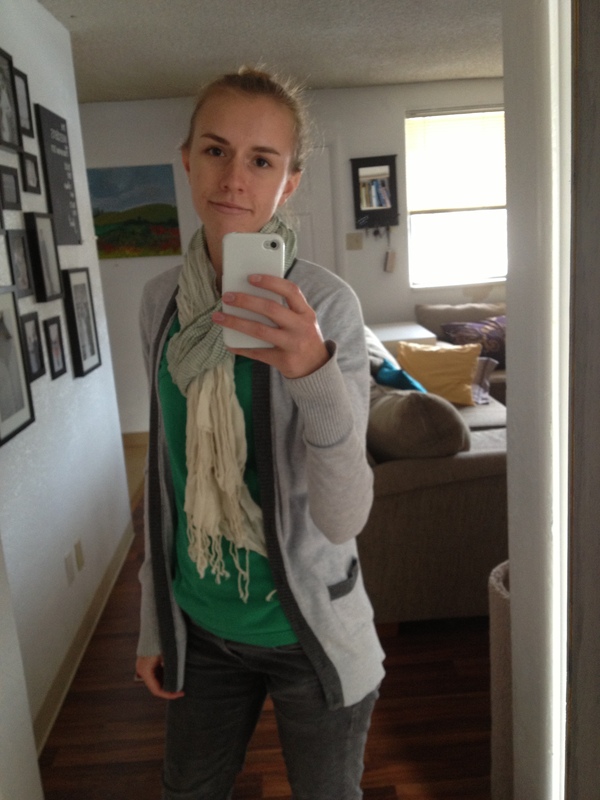 I have a wishlist of green things I wish I could add to my wardrobe. But I can’t have them, so I’m inspired to keep my eyes peeled wherever I go to attain similar items that will make me happy. 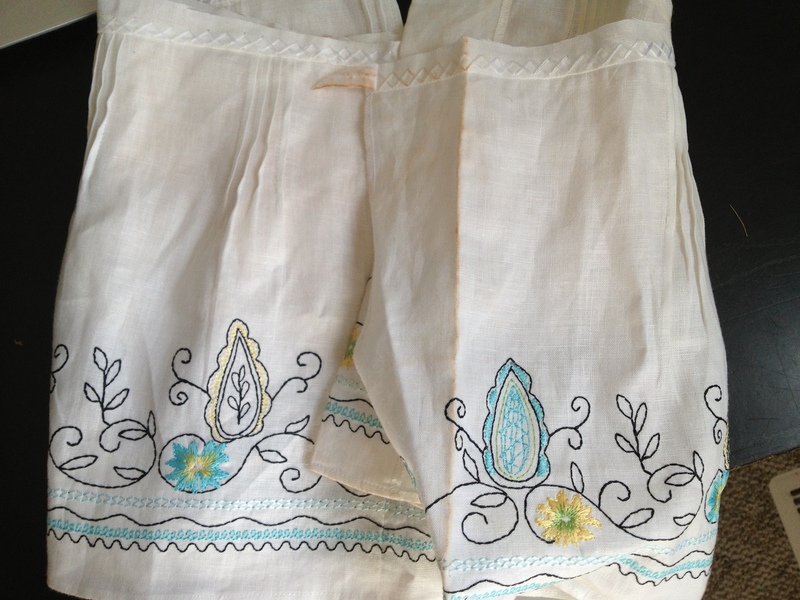 I would love a maxi skirt especially…can you imagine all that awesome green fabric swirling around you when you walk? 2. A green dress. Any will do. Both of these dresses have elements that I like, and things I don’t like. I have yet to find the perfect green dress. I find them interesting. Could I pull them off? I have a green coat (although it’s so old it’s turning yellow in places…gross), but I think a turquoisey-green blazer would be sleek and cute. By the way, all these are from my Pinterest board, if you want to see links for the ones I didn’t credit. 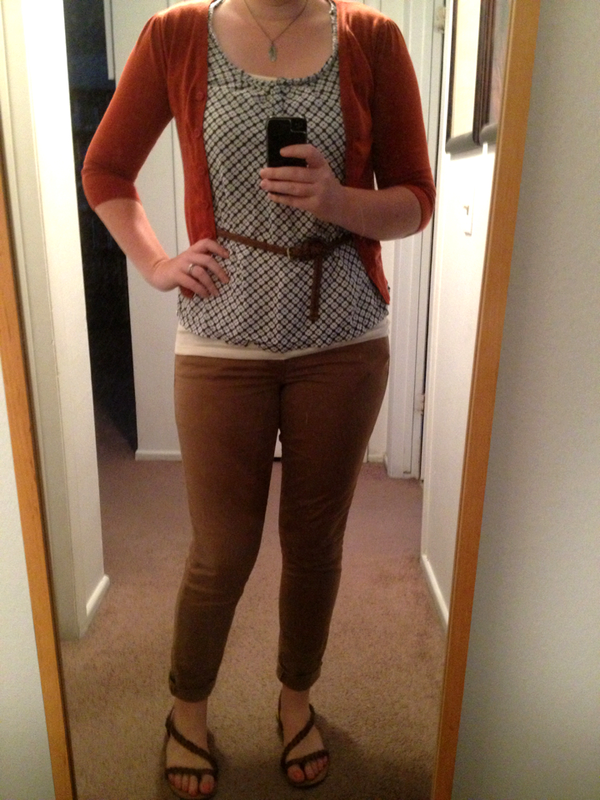 I pretty much wear very similar things from day to day, especially when the weather starts cooling off. 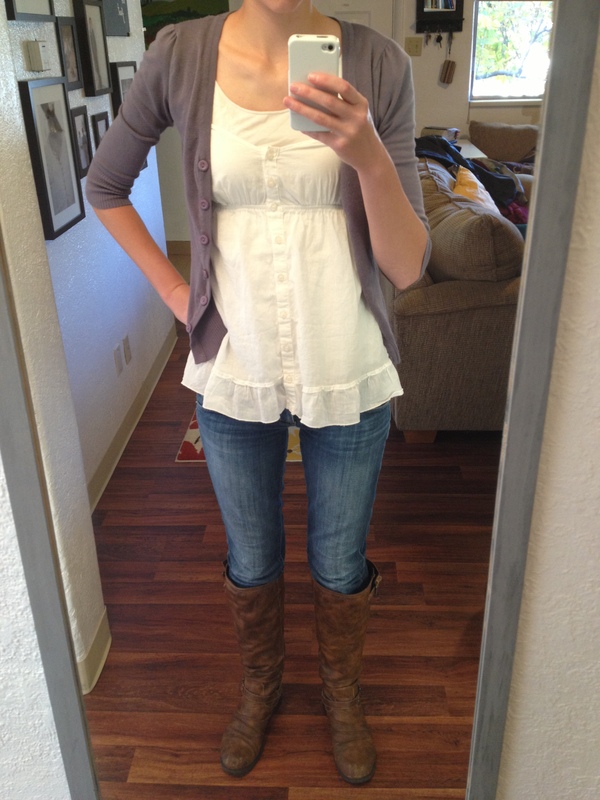 This generally consists of a shirt and cardigan or sweater, scarf, skinny jeans, and flats or boots. It doesn’t make for the most interesting blog posts, but I will persevere (and I guess you will too). Also…nothing has changed. 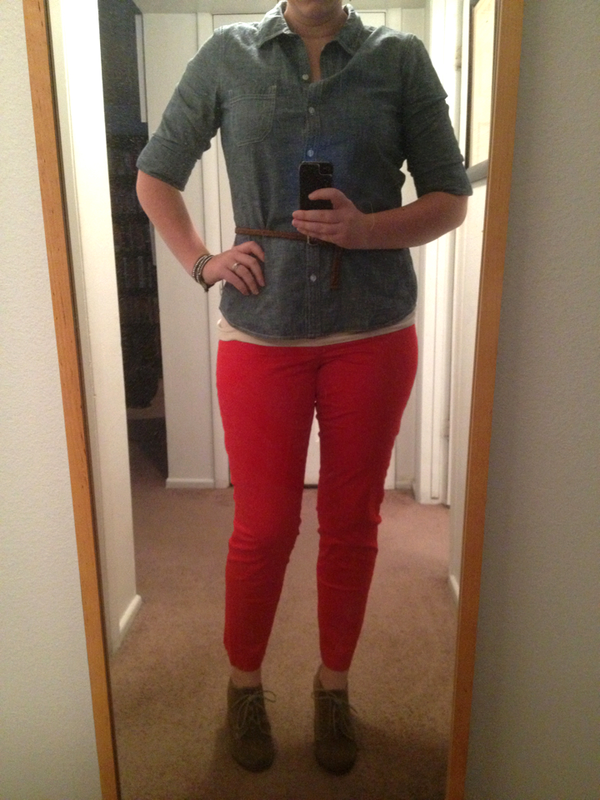 Apparently my clothes are all still from Gap and Old Navy. Whatever, I like them, deal with it. Actually, this picture is deceptive. I didn’t vote today. I voted like two weeks ago. 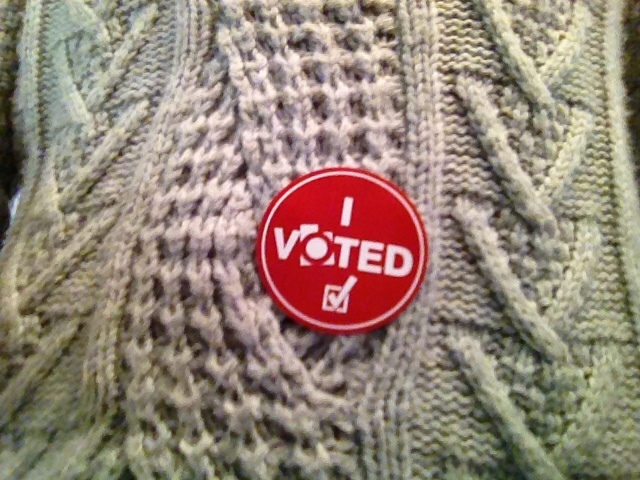 But because I always do mail-in ballots (still registered in California…I refuse to become a Utah resident before it becomes absolutely necessary), I never ever get a sticker. Sad face. So Sam gave me his. He voted today. It was a weensy bit of a fiasco. Anyway. Today I feel kind of like a fisherman. 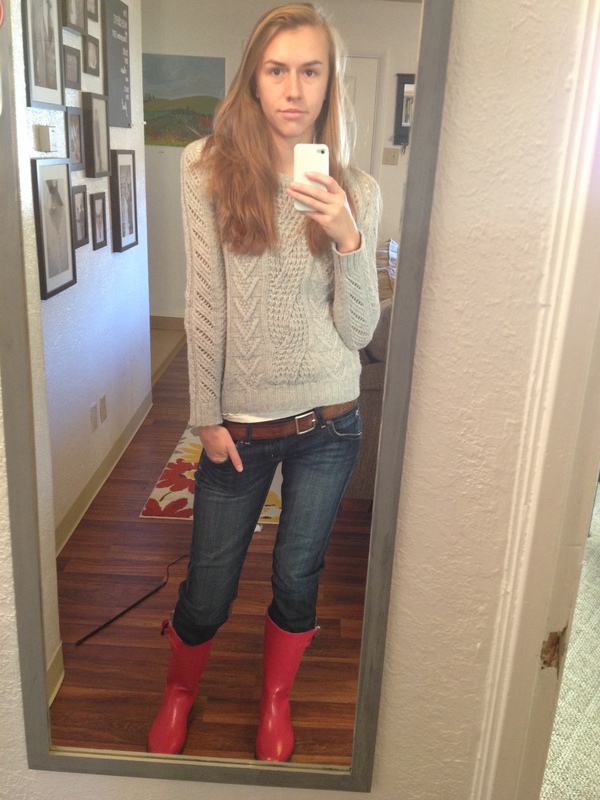 That feeling was accentuated when I had the black galoshes. With pink…maybe I feel a little less like I’m dressed up for career day. I’m listening to Major Minus. And finishing preparations for Itly. I-TA-LY. Yes, as in there’s a snail in your ear (Megan). Ten more days! Just a simple look from Sunday. 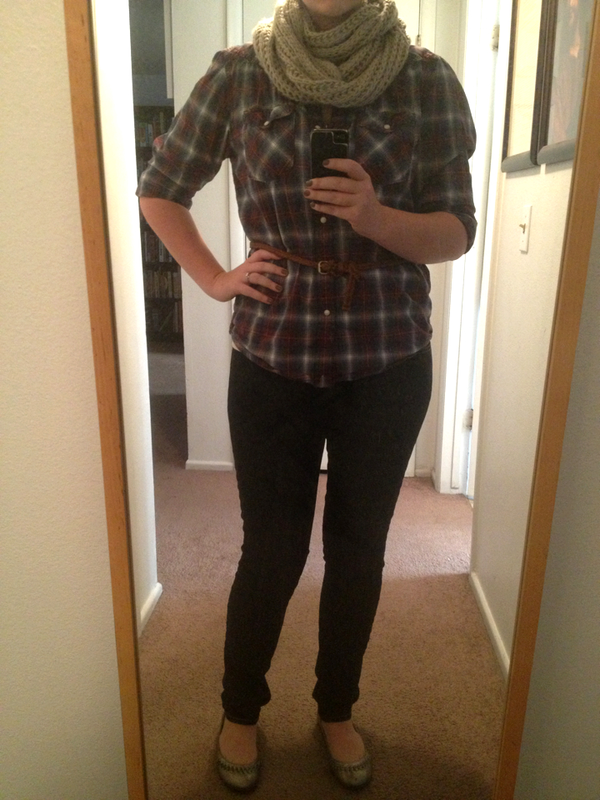 I’m liking the whole branching-out-from-the-three-shirts-I-normally-wear thing. I like this shirt a lot. I just forgot. C’est la vie! Shop your closet! Also, I’m really happy that my hair has been behaving as of late. Therefore I can wear it down without getting mad. You know, I feel like there are about 3-4 weeks in a hair-cutting cycle when I am actually pleased with my hair. Fwah. The other day Sam tore a belt loop. The next day he tore/wore a hole in the crotch of the same pants. “Welp, time to get new jeans I guess.” “But you already have two other pairs and we no can haz moolah,” said I. So while he was school I stole away to Megan’s to grab her sewing machine and set about to fix those pantaloons if it was the last thing I did. 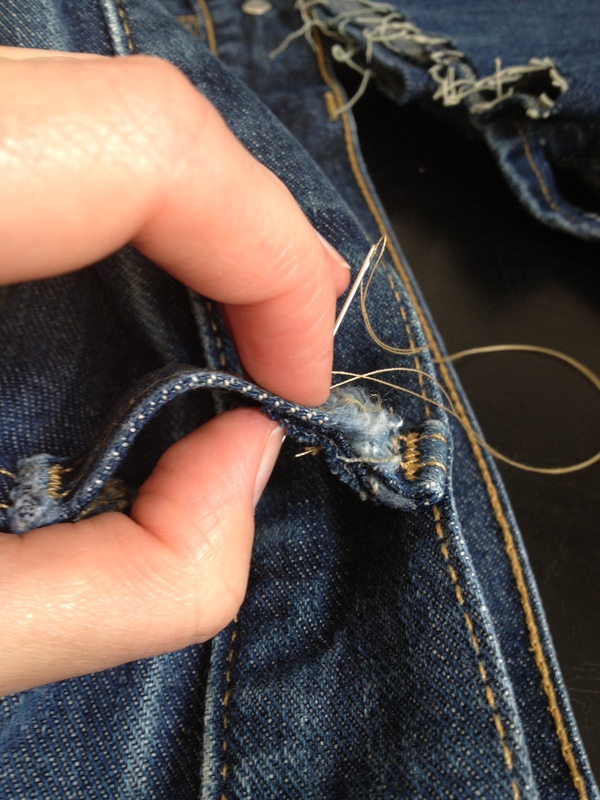 I’m assuming pretty much everyone knows how to patch a hole in jeans. So I’m not going to talk about that. What I wanted to talk about was how to fix the belt loop. There are precisely 1.1 million posts/tips/whatever on how to fix a loop that has pulled away from the pants at the bottom. Like this. But the way Sam’s loop tore was at the top, like his belt just wore through it. And there was nary a tutorial on that. So I had to use a little ingenuity. Anticipating that maybe that might happen to other people, I took photos of the process so that somewhere out there on the interwebz (and right here on this blog) there might be a tutorial on that. So. It’s really quite easy. Get a needle and thread. 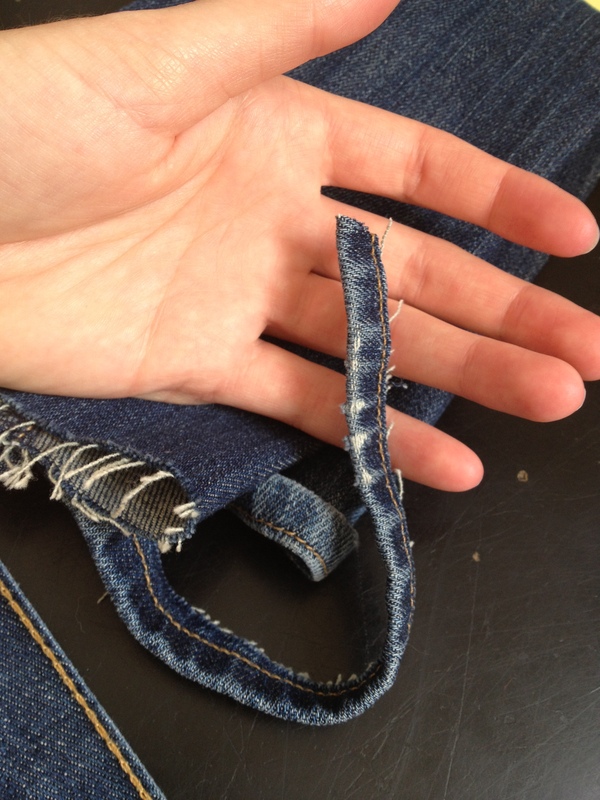 Cut a small piece of pants hem from any extra jean fabric that you may have on hand for patches and such. I used a bottom hem, but I imagine if you trimmed it properly, you could use an inseam instead, although it may not be as strong. 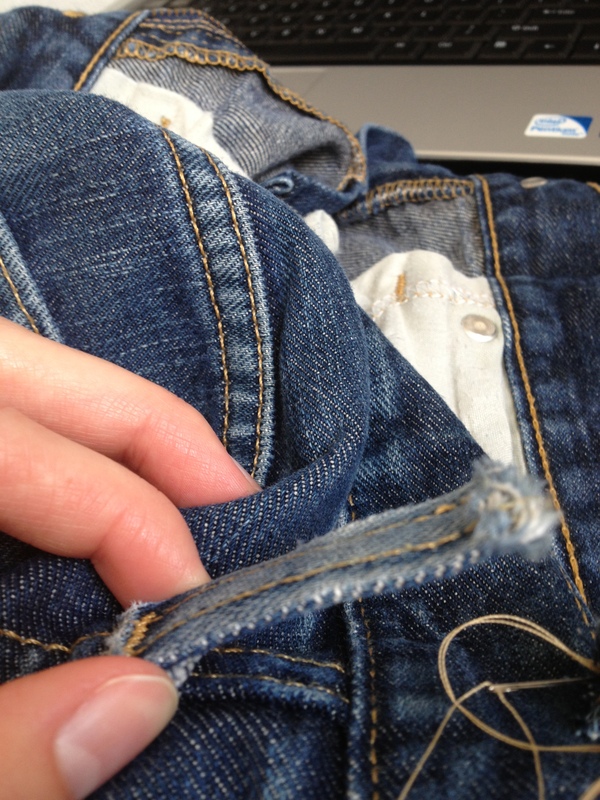 Sew the hem piece tightly and securely to the top of ripped piece. 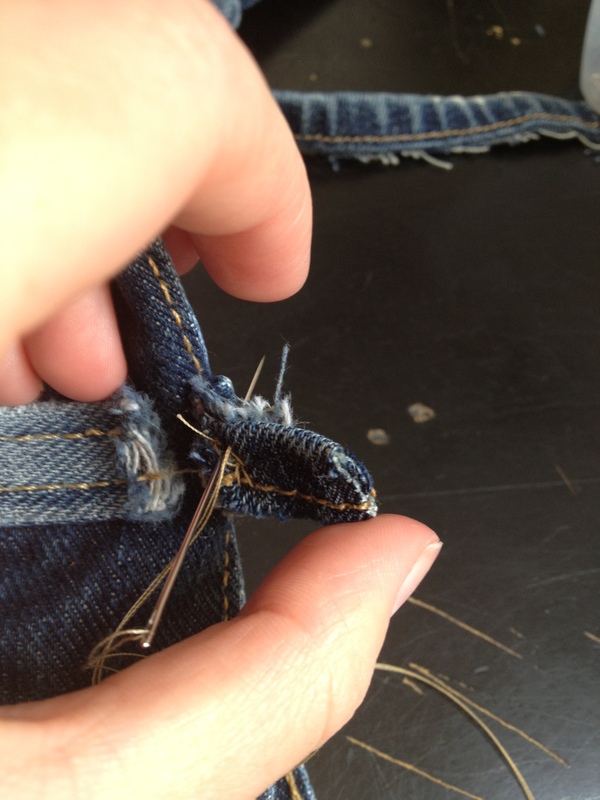 Then line up the bottom piece and sew it tightly to the bottom piece as well. I know it’s thick and you’re doing it by hand, but use small, tight stitches and be sure to cover the entire surface and not just one line! My stitches were scattery and uneven, so staying in a line doesn’t matter really. Do long stitches to bridge the gap where the tear is. Do a few of them. It won’t be super secure because they’re long, but they’ll help secure the rip and keep things from popping/wearing through sooner. 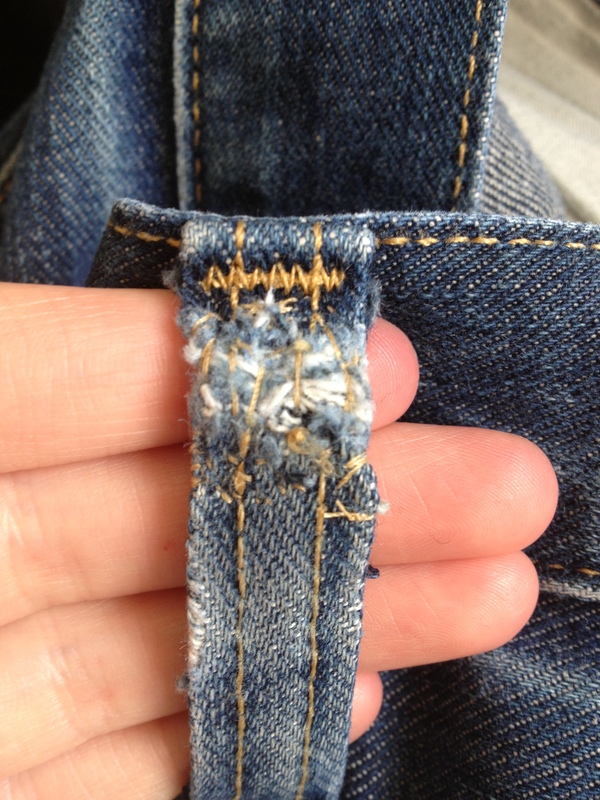 Also take this opportunity to do a few binding stitches on the side of the repair for extra strengthening. And that’s it! Good as new! It took me only a few minutes total to finish. And maybe it won’t last forever, but it’ll last until we can buy Sam a new pair of pants. Woohoo! Oh, side note. 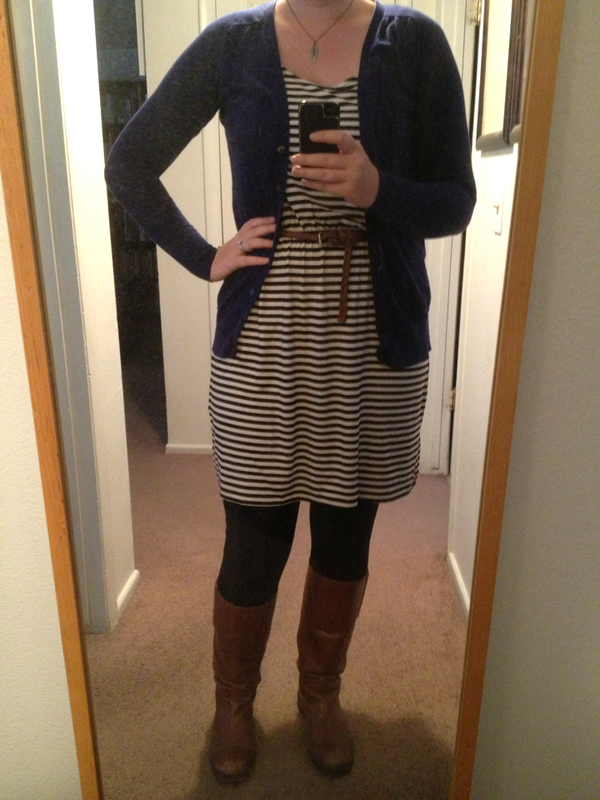 Some of you lamented over the fact that I didn’t have a “before” picture for the skirt in this outfit. I still don’t. BUT. I realized I kept the gross nasty bottom for some reason (although I threw it away after taking this picture), so I have a picture of that to give you an idea. 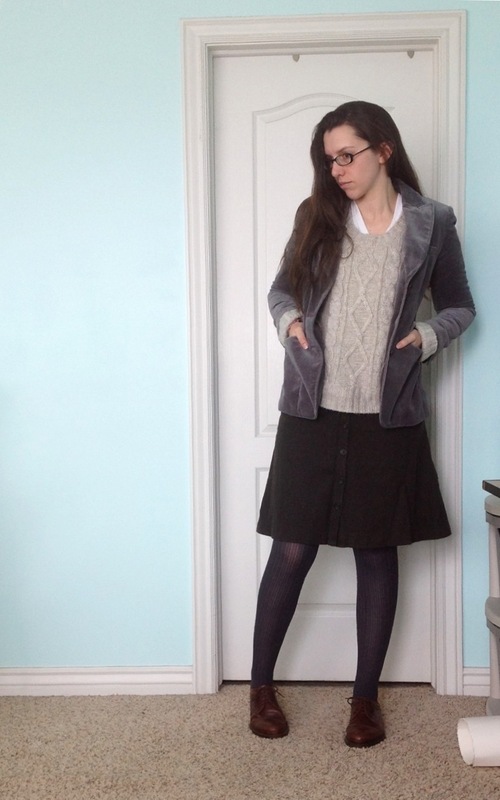 Keep in mind, this skirt was floor length, and everything I cut off had tannish-brown stains from something. Like maybe they walked through a pool of liquid concealer. This is from yesterday. It was comfy. I feel like I’ve been wearing too many skin-tight shirts lately, so I’m trying to use the baggier/flowier/whatever items I have in my closet. Hence. Pence. Fence. Etc. Oh, that shirt/cardigan combo (and actually those pants too, although they were dark and brand new back then) is what I wore in my engagement photos last year, I just realized that. Totes awk. Maybe. 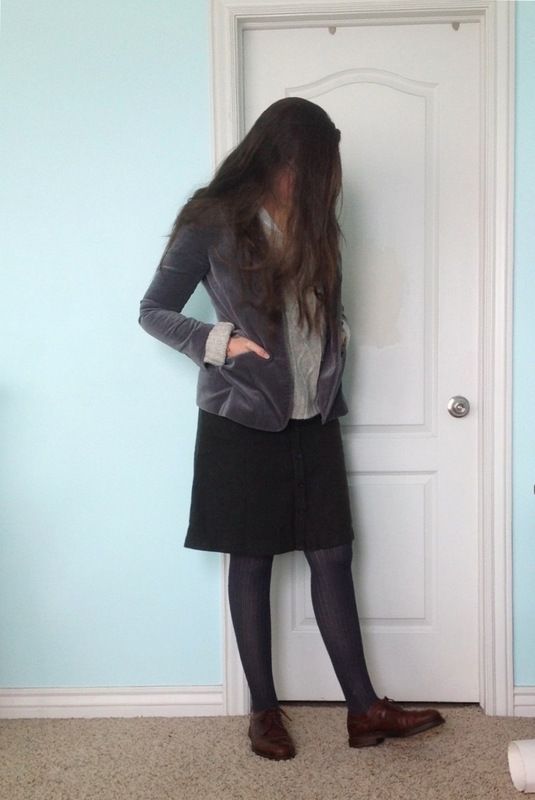 Next: what I wore today (and am currently still wearing WHAT). I’m not including my feet because I seriously just alternate between my pink boots and my brown boots and very occasionally my converse, and I’m sure you’re tired of seeing the same shoes all the time, especially since they are so large and all-encompassing. Also…those saggy, baggy elephant eyes…I’m going to blame the lighting this time. You don’t need to know that I’m still really tired because it’s irrelevant and I’m always tired and if I cared enough I would just wear makeup but NO. Just be glad that I’m trying to incorporate my head in more of these photos because the headless horsewomen thing isn’t going to cut it for much longer. This is my “I don’t care because I am a cool person going to a rock concert” look. Or something. 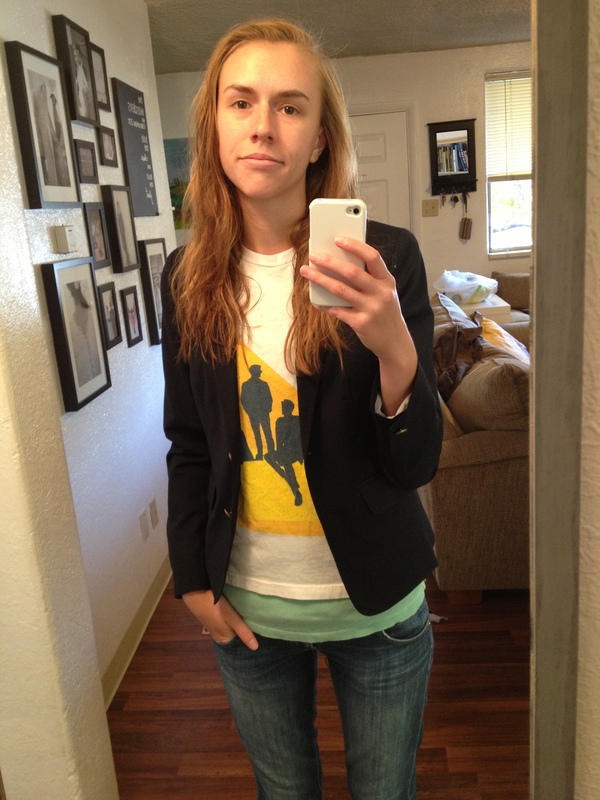 I do want you to know that when I got this blazer I hoped one day to have a band shirt that I could wear with it. Because I think they go really well together. La di da. So yeah, what better band shirt to wear than the one I got at the concert for one of my favorite bands? Or you know, maybe…because it’s the only band shirt I own. PS I’m listening to “2nd Law – Unsustainable” from Muse’s new album. Gaaaaaaaah. I think that one, “Madness,” and “Follow Me” are probably my favorites. Also “2nd Law – Isolated System.” Although that one kind of feels sad. Tomorrow is Halloween…obv. 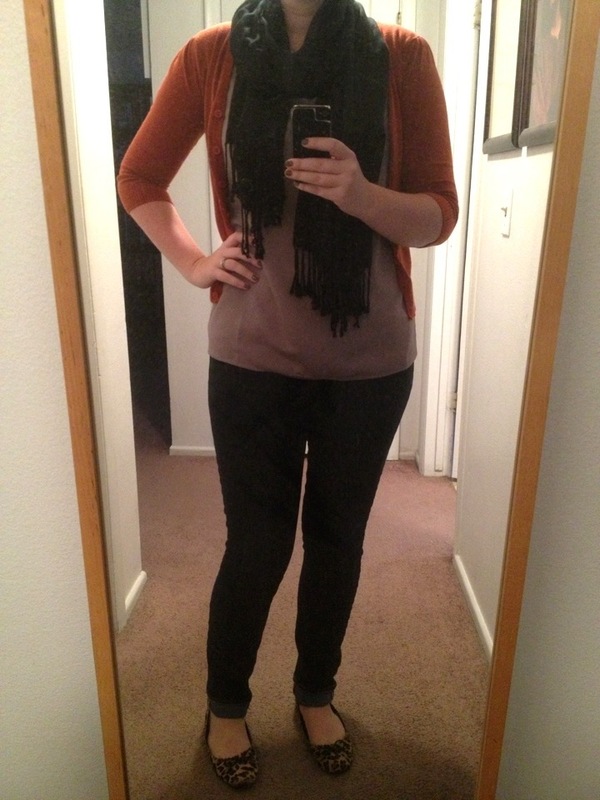 So here’s my pre-Halloween outfit with fall colors and orange and black. Yaaaayy. It’s also kind of an awkward time of year weather-wise: this morning it was in the mid-30s and by afternoon it felt like 70. How to dress for this weather? It’s a challenge I tell you. These pictures look weird with no head. First of all, I realize that this post isn’t all that relevant to about 99% of our readership (is that even possible when you have 2 readers?) but I felt kind of inspired to write it, so there you are. Also, I’m kind of writing this also to distract myself from the hurricane. I know lots of peeps out there (including our brother! ), and my in-laws are getting pounded, and I’m trying not to worry. When I was planning my wedding last year, I had a lot of restrictions financially, so there were some things that I didn’t get to go all out on. However, I did have a specific idea for what I wanted that I didn’t want to compromise on, and that was the overall “style” of my wedding. I then had to make it work based on monetary restrictions. “Style,” especially in the context of a wedding, can include everything from the venue to the centerpieces to the food. I suppose you could also call it a theme. Our theme was something along the lines of “Victorian-ish Conservatory.” But I mostly want to talk about the clothes here. I think the one thing I really want to stress is that when you have a wedding, you don’t have to turn away from who you are or what you’re comfortable with just to fit the expected mold. You don’t need a glittery ball gown if you don’t like glittery ball gowns. You don’t need every groomsman in a matching neon tie if you don’t want that. Just because people do it that way normally doesn’t mean that YOU HAVE TO do it too! My main concern (aside from affordability) was comfort. For one thing, I don’t like constricting dresses, especially short-sleeved ones that cut into my armpit and rub me raw. I’m also not a fan of poofy dresses. I wore one to my junior prom and I felt ridiculous all night long. 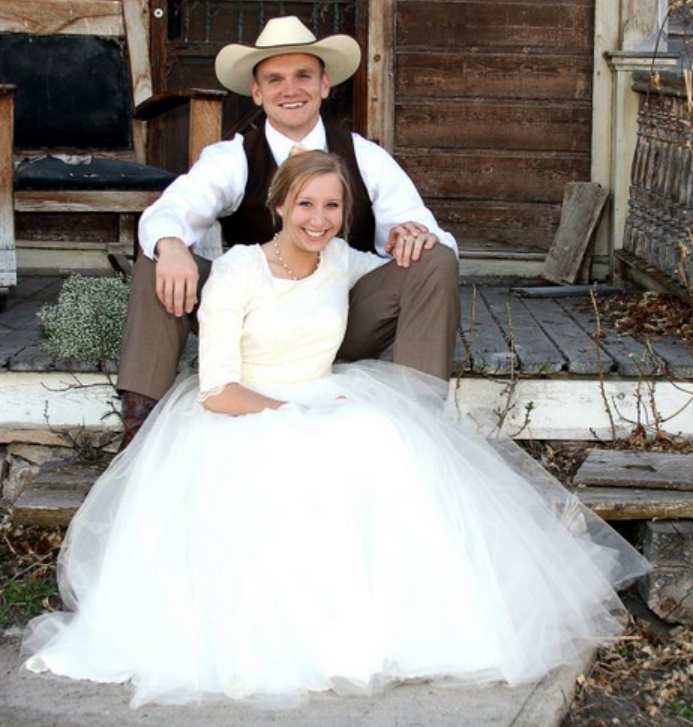 Also, I got married in the middle of December. It was 14 degrees when we got married. So I wanted to be sure it was possible to stay warm, even a little bit. SO. I looked for a dress that fit my bill. 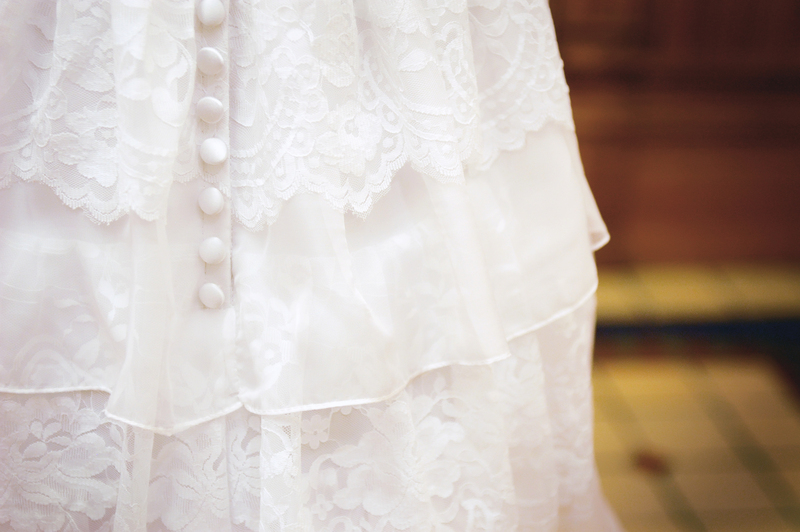 I couldn’t find one that really did, so I turned to the option of having the dress designed and made from scratch! I used this company, which was actually just a girl in the area. She worked with me closely as we talked extensively about fabrics (I have never seen so many types of lace in all my life) and measurements and everything else. She got it done insanely quick, and I paid all of $715 for it. And it was comfortable enough for me to wear it all night while I danced away! To address the warmth issue, I got a coat (the aforementioned gnome coat) to wear when I could. As for Sam, he got a tailored three-piece wool suit that was supposed to be reminiscent of a vintage era. 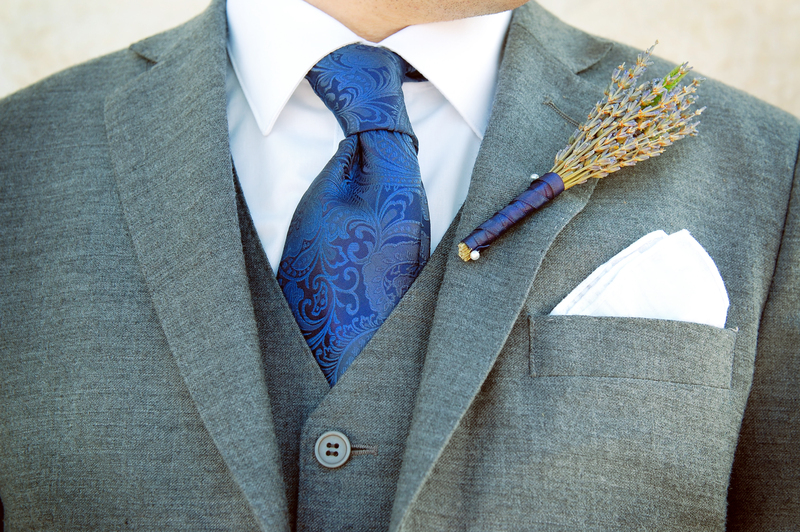 His tie was a dark blue paisley, instead of anything solid. Again, anywhere I could remind people of a vintage-y feel, I took advantage. I also didn’t want everyone to be too matchy-matchy. Except that I was worried a little that the dresses for bridesmaids would be too different, so I made them match. I wish now that I hadn’t. It would’ve felt more authentic. The groomsmen had matching blue paisley ties (different from Sam’s) and were free to wear a grey suit of whatever they had. And there you have it. 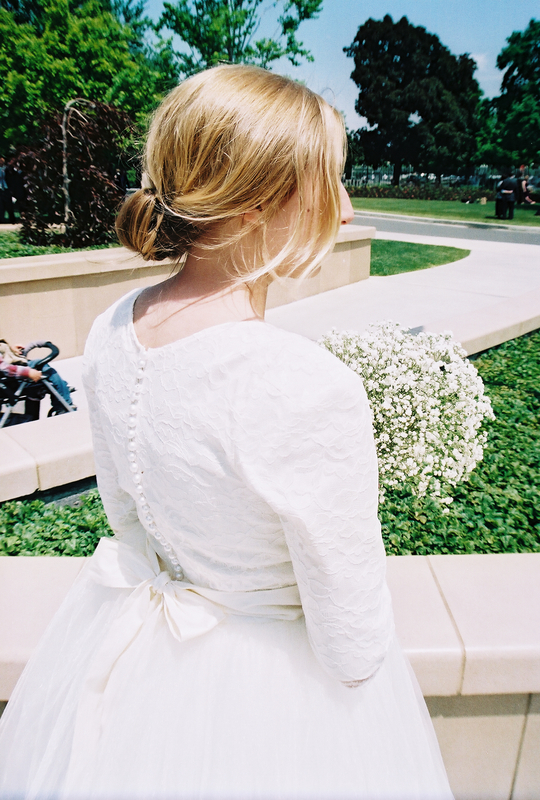 Here are a couple of pictures of my friend’s wedding that show the “style” of her wedding. She had a theme, which was something along the lines of “Summer Country/Cowboy Chic” or something. 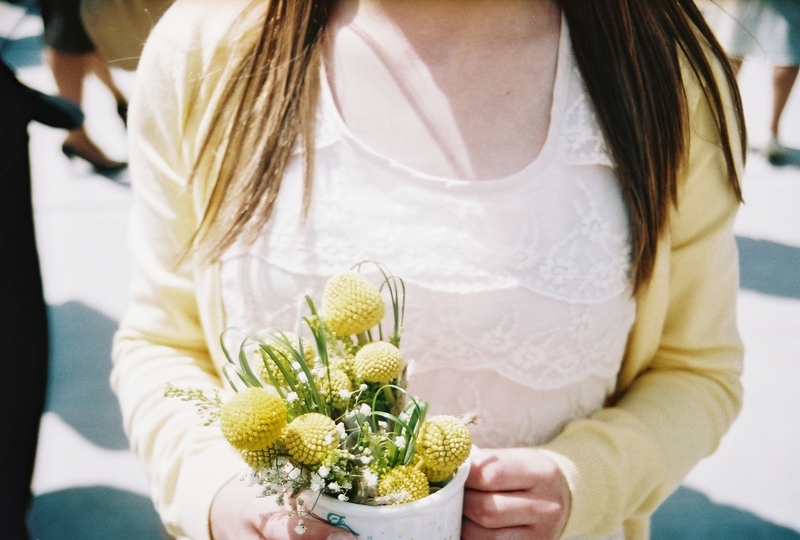 Every bridesmaid wore a cream or white lace-ish dress of her choice and a pale yellow cardigan. Bonus: she made that dress all by herself! With the help of her mom. And her grandma. 😉 Also, it was not white, but sort of cream. Yet another example of going with what you want and what you’re comfortable with. If everyone tells you you need white and you want cream, go for it. I didn’t have a good picture of the whole look together, so I stole this from their Facebook…Mel, if you ever see this, don’t freak out! My outfit is nothing exciting, I just wore my ancient jeans, my ancient converse, purple argyle socks (what? 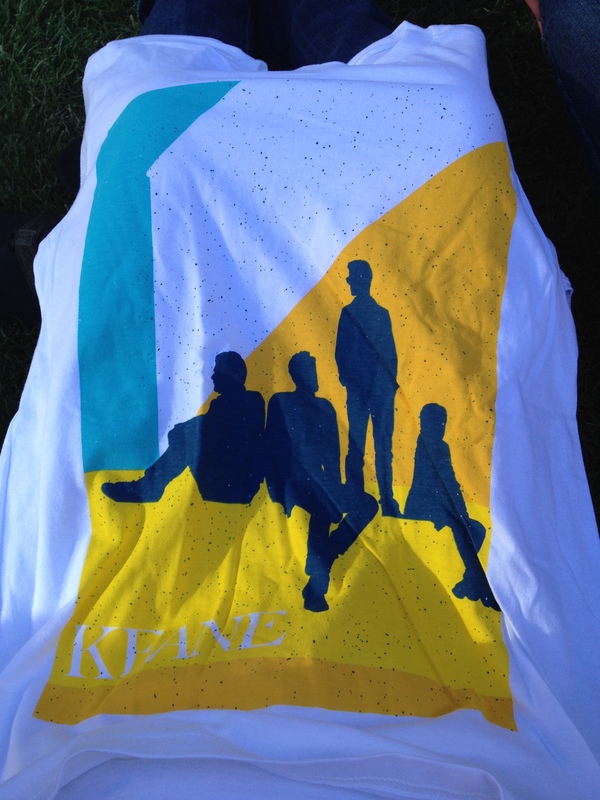 ), and this shirt. It’s (relatively) new, so here’s the debut! I got it at a TJ Maxx in Norwalk when I was living out there in Connecticut with my in-laws over the summer. I feel like Abby and I went shopping at TJ Maxx a lot (though I only ever got this shirt)…oh and Loehman’s…man I wish they had one of those out here! Anyway. You should be proud of me for actually showing my face in the picture today, of all days, because I look really, really tired (which I am…thanks to a lot of crazy dreams/nightmares lately and a poorly-made batch of earplugs and who knows what else) and because my hair looks sort of frizzy. Guys I’m really lazy. I don’t even have motivation to really do my hair. 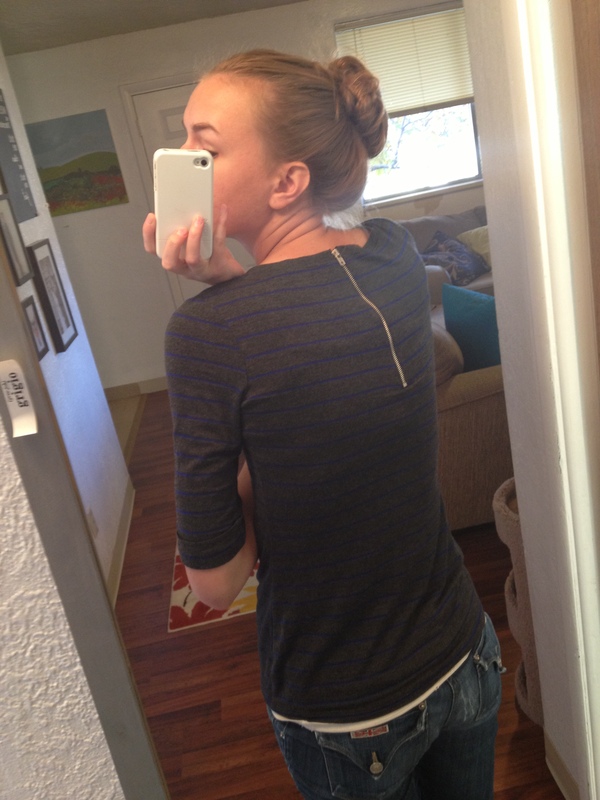 Here’s my favorite part of the shirt (oh and look, you can see the patch on my rear where the pants are about to split. I really should stop wearing these jeans). Also, lo specchio e grigio. Or something. Silliness is what this is. Side note: speaking of zippers, does anyone remember that weird picture book that didn’t have any words, just pictures of an animal who would unzip its skin and a smaller animal would be inside? I think it ended with a mouse. It was actually a little creepy. We're three sisters living in Utah who like clothes but don't have a lot of money. We try to dress practically, modestly, and stylishly, and try to mix up the things we have to create more and better looks.